If you need to print professional black and colour documents quickly without any lapse in quality, opt for the HP Colour LaserJet M553 printer. The Colour LaserJet M553 series printer uses black, cyan, magenta and yellow HP Colour LaserJet M553 toner cartridges with JetIntelligence to print striking business documents in seconds. The LaserJet M553 colour printer has an off-white or greyish exterior, 1 GB of standard memory and a monthly duty cycle of 80,000 pages. The printing resolution for the Laser M553 colour laser printer is 1200 x 1200dpi. Business users can print documents on the move as the Colour LaseJet M553 colour laser printer has support for mobile printing technologies such as HP ePrint and Apple AirPrint. The high capacity HP M553 replacement toner cartridges can last for up to 12,500 black pages or 9.500 pages per colour. 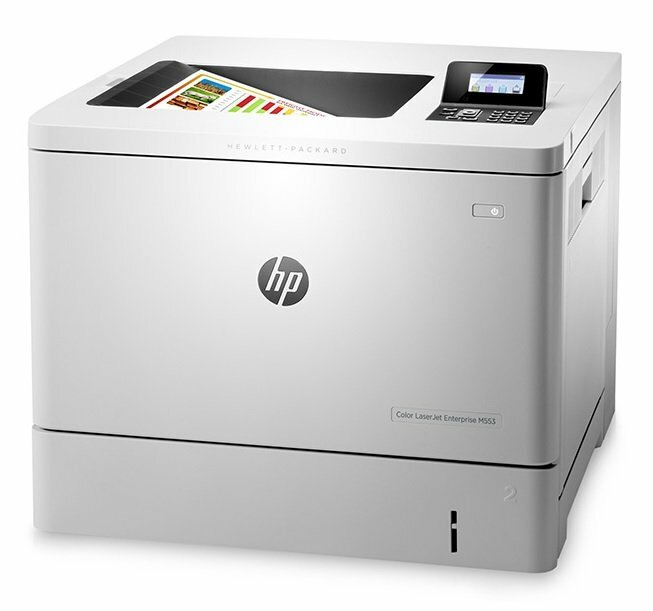 The energy-efficient HP Colour LaserJet M553 printer can print from sleep mode in as fast as 9 seconds. The hard disk drive on the HP Colour LaserJet M-553 laser printer is only optional, as are numerous other features such as the printer cabinet and extra input trays.